Tofana di Rozes in the background and me in the outdoor kitchen. Plenty of news after a long times without blogging anything! STAY TUNED! 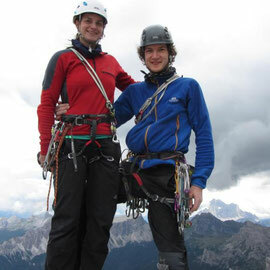 The 2012 Alpine-Schwigel (Schweikart&Igel)-Road-Show started in August in Tofana Dolomites near Cortina d’Ampezzo. Beautiful south facing walls up to 500m, good quality rock and bolted routs. Well…Tofana di Rozes hid behind big clouds in the morning. 6 quickdraws would have been plenty (particularly within the crux 7b+-pitch which depicts 4 (!) 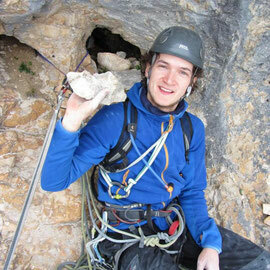 bolts along 35m) and Chrissi (Hulk) Igel plugged out some kg of dolomite in the last pitch. We onsighted the route (respectively a.f. for the Hulk). Summary: Luckily no injuries! 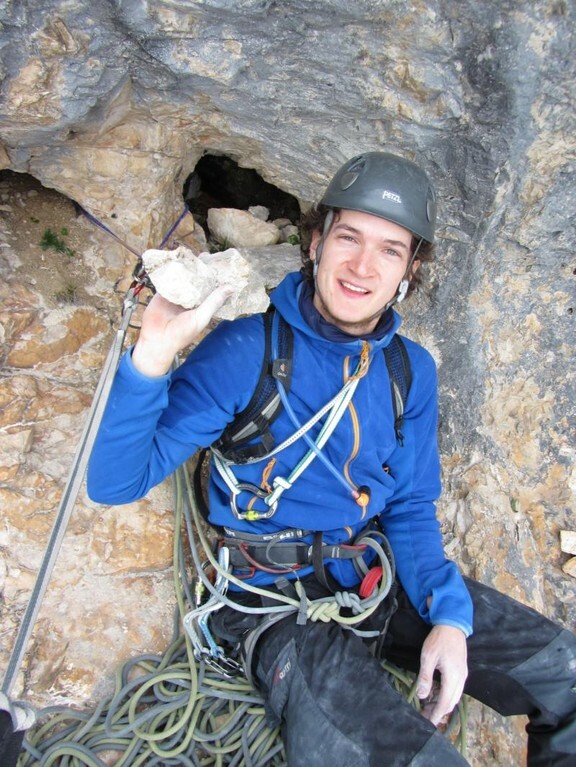 Beautiful and exciting face climbing on surprisingly small crimps! 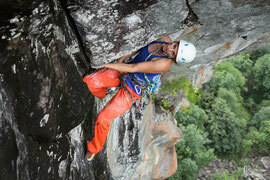 Facts: Bolts throughout the Route, fairly runout, 6a+, 7a, 6b, 7a, 7a, 7b+, 6b, 6a+, 6b+ (310m); abseil down the route! Tip: Big balls, line meanders around the bolts, the belay after pitch 7 (6b) is ca. 20m straight above the last bolt, then traverse! One of THE Pause-classics! 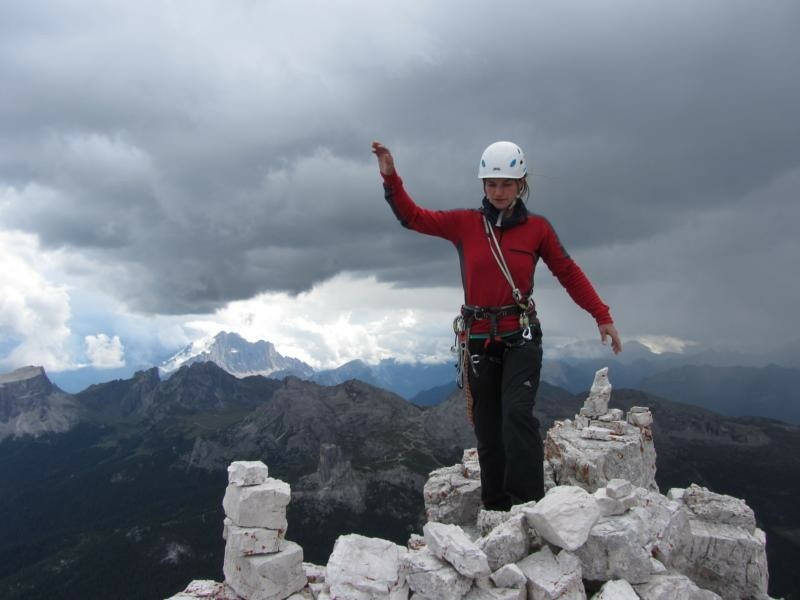 850m to the top, cracks, dihedrals, roofs and…chimneys. Difficulties up to 6c along 22 pitches. First ascended in 1944 as an aid climb there are old pitons of any quality within the hard pitches. Talking about “hard” pitches we were surprised how tough 6c polished roofs can be! 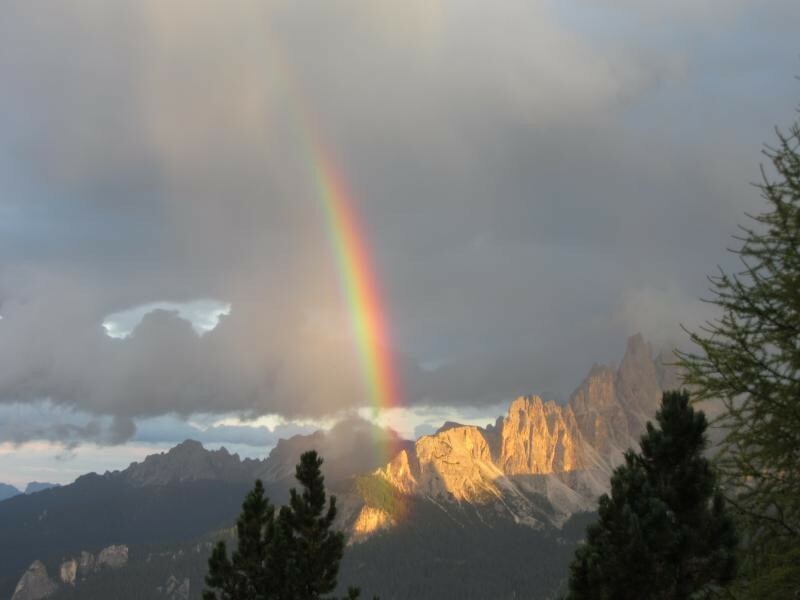 After the roofs, the so called “schiena di mulo” expects the unaware freeclimber. This is a chimney that turns into an overhanging offwidth where the single fist-jam position is blocked by a wooden chockblock. I fought left, maybe 7a+ to get then pitch! On the last 200m we met Robert and Ben, two Fluglotsen from Saxony and Frankfurt who explained to me, that 1st: a Sanduhr only exists in Elbsandstone, because of the “sand” and 2nd: you always need plenty of food for the summit. So they shared their bred, tofu schnitzel and chocolate with us- and also dinner and beer afterwards at Refugio Angelo Dibona! Mille Grazie! Summary: Full alpine adventure. 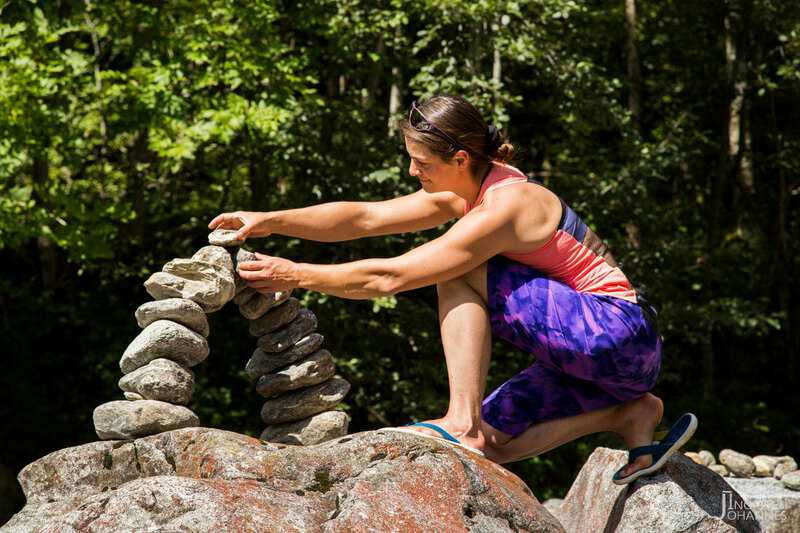 All types of climbing skills required! Facts: Some old pitons, belays can be found with 2 pitons. 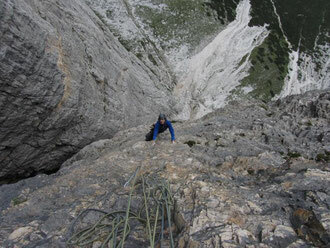 650m + 200m of easy scrambling to the top. Hike down. Tip: Do not expect the route to be done after the roofs!!! 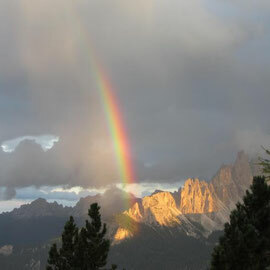 The 2012 Alpine-Schwigel (Schweikart&Igel)-Road-Show started at the Tofana Dolomites near Cortina d’Ampezzo in August. 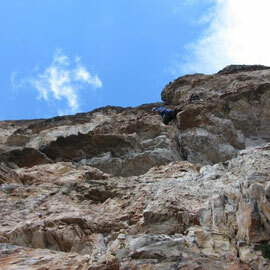 Beautiful south facing walls up to 500m, good quality rock and bolted routes. 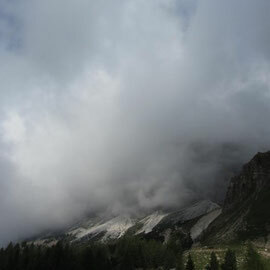 Well…Tofana di Rozes hid behind big clouds in the morning. 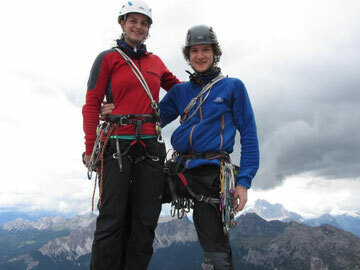 The 2012 Alpine-Schwigel (Schweikart&Igel)-Road-Show started in August in Tofana Dolomites near Cortina d’Ampezzo. Beautiful south facing walls up to 500m, good quality rock and bolted routs. 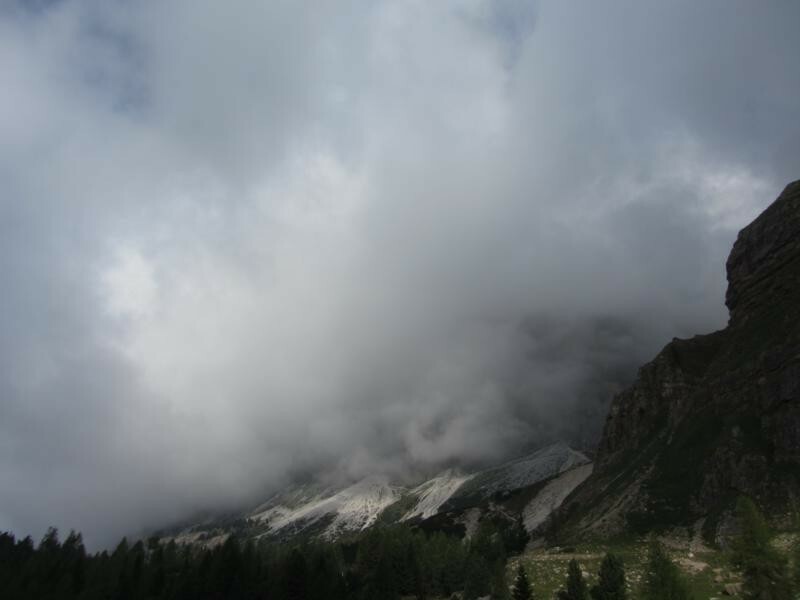 Well…Tofana di Rozes hid behind big clouds in the morning. Chrissi cruising the second last pitch. Six quickdraws would have been plenty (particularly within the crux 7b+ pitch which depicts four (!) bolts along 35m) and Chrissi (Hulk) Igel plugged off some kg of dolomite in the last pitch. We onsighted the route (respectively a.f. for the Hulk). Chrissi in his element: Roof cracks! One of THE Pause-classics! 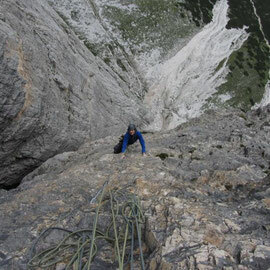 850m to the top, cracks, dihedrals, roofs and…chimneys. Difficulties up to 6c along 22 pitches. First climbed in 1944 as an aid climb there are old pitons of any quality within the hard pitches. Talking about “hard” pitches we were surprised how tough 6c polished roofs can be! Summit and thunderstorm in the background. After the roofs, the so called “schiena di mulo” expects the unaware freeclimber. This is a chimney that turns into an overhanging offwidth where the single fist-jam position is blocked by a wooden chockblock. I fought left, maybe 7a+ to get that 6a+ pitch! 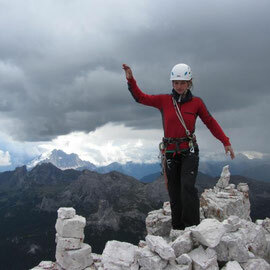 Summit of Tofana di Rozes. On the last 200m we met Robert and Ben, two flight lotses from Saxony and Frankfurt who explained to me, that 1st: a "Sanduhr" only exists in Elbsandstein, because of the “sand” and 2nd: you always need plenty of food for the summit. So they shared their bred, tofu schnitzel and chocolate with us- and also dinner and beer afterwards at Refugio Angelo Dibona! Mille Grazie! Facts: Some old pitons, belays can be found with 2 pitons. 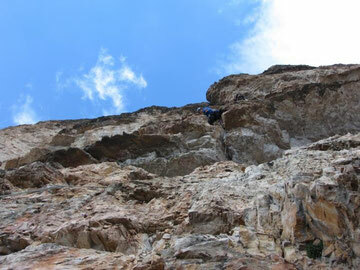 5, 5, 5c+, 5+, 4+, 6a, 4-, 5, 6b+, 6a+, 6b+, 6a+, 4, 5+, 5+, 4, 4+, 3, 4, 3+, 4-; (650m + 200m) of easy scrambling to the top. Hike down.